Fuel cells are devices converting the chemical energy stored in a fuel directly into electricity for power generation with high efficiency. 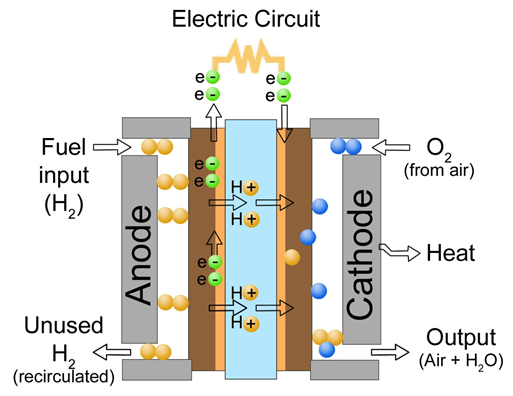 Proton Exchange Membrane Fuel Cells (PEMFC) using pure hydrogen and air produce electricity with only water as a waste product according to the following reactions, thus eliminating any harmful pollution or emission at the point of use. The core of the PEMFC is the Membrane-Electrode Assembly (MEA). It is composed of an ionomer (proton conducting polymer) membrane sandwiched between two electrodes (electrocatalyst nanoparticles on an electronic conducting support). A schematic representation of a MEA and of the operating principle of a PEMFC is depicted below (drawing: Dr. Surya Subianto).